Because of my arms (which are not quite as toned as I'd like) I would love to make a pair of gauntlets out of some leftover material to match the costume I've made. The problem is, that even though I've seen other dancers wearing their gauntlets, I don't really know how they're constructed — except that they have elastic in the top. Could you let me in on the secrets of perfect gauntlets. Should I use a zipper in them to close the seam, or would velcro or hooks be better? Can I make my own pattern? The material I've chosen is a stretchy velour. I would love to include fringe and beading on these to match my belt and bra, but will that make them too heavy? As an avid sewer as well as a dancer, I've loved your other tips and have found them incredibly helpful. You bring up some complicated gauntlet issues, and I'll try to touch on all of them briefly. Sleeves can be attached to the costume or not. If not attached, they're called gauntlets and cover the arm like a glove. They can cover the whole arm, or reach just above or below the elbow. Very short ones are called cuffs or wristbands. I don't ever make zippers in my sleeves — it's stiff and bulky, hard to fasten, and unnecessary. You only need a short opening big enough to get your hand through, and I fasten this with two or three buttons and loops, or snaps. I start with a narrow commercial sleeve pattern, fit it to my arm perfectly, then use it as a basic pattern to make all of the above pieces. It may be attached to the bra or bodice of the costume at top only, or sliced across the top to become a gauntlet. The first crucial question is whether your sleeves will be made of stretchy or non-stretchy fabric. Stretch would be knits like velour, stretch lace, and mesh. Non-stretch would be wovens or traditional lace. If the fabric does not stretch, the sleeve must be cut on the bias for flexibility, or have extra elbow room in back, which is darted or eased into the seam. Lack of elbow room results in a fitted sleeve that's uncomfortable, tugs and pulls the gauntlet down with every bend of the arm, which is why you see dancers' gauntlets always slipping down, even if the elastic is snug. In fact, I put elbow ease even into my stretchy gauntlets. It's more comfortable and the gauntlets are less likely to slip down. At one time fitted sleeves often had elbow darts, but it's difficult to find a pattern like that now, which is why I alter my basic sleeve pattern as illustrated. I adjust a fitted sleeve pattern to the proper length (very short, for me) and determine where my elbow is located. Later you'll try on the sleeve to make sure this is correct. I slash the back of the pattern as illustrated, to give it about one inch of extra length for non-stretch, or a half-inch for stretchy fabric. This extra length can be eased, darted, or double-darted into the front side of the seam. Make two sample sleeves out of cheap fabric, one stretchy and one non-stretchy. Try them on to check the position of the elbow, the fit and the length. Use these as your basic pattern. Slice the top off the sleeve cap as illustrated to make a full-length off-the-shoulder-sleeve that is tacked to bra strap at the corners as in the photo. Click on the photo to the right to see these sleeves in more detail. I love this style because I never have to be concerned about it slipping down — one less thing to worry about when performing. If you prefer gauntlets, cut the sleeve shorter from the top as illustrated to get the look you want, and add an elastic inside the edge. I like to make it a separate band that's tacked to the sleeve edge at three or four points. One can also sew decorative stretch lace directly onto the edge. Beads and fringe can weigh the sleeve down and make it difficult to keep in place. Don't use the thick heavy Egyptian fringe that's used on the belt. Use a light fringe, scattered strands or tassels, or just wrist tassels. I'd use the attached style of sleeve or the below the elbow style of gauntlet. If using mesh, use the Powernet type that is strong enough to hold the weight of beads. Ask The Costume Goddess: Falling Gauntlets. Discusses how to prevent your gauntlets from falling down while you dance. Ask The Costume Goddess: Sleeve Variations. Suggestions for various styles of sleeves. Ask The Costume Goddess: Jiggly Arms. Suggests arm accessories for camouflaging flabby upper arms. 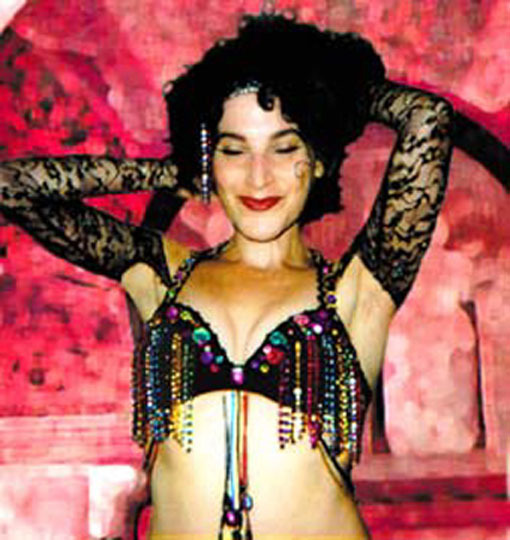 The Costume Goddess Tells All: Arm Costume for Bellydancers. Review of book by Dina Lydia.